The kidneys consist of millions of nephrons in each kidney. 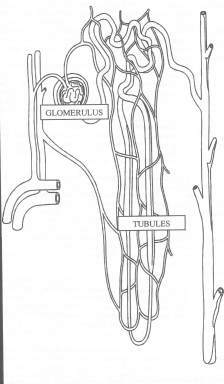 A nephron has a filtration unit called teh glomerulus. Here there is intimate contact between blood vessels and the kidney cells which allows the exchange of waste products or protein metabolism from the blood to the urine. We routinely measure some of these waste products in the blood called the BUN and the Creatinie. From the glomerulus, the urine proceeds to the kidney tubules. The cells lining the tubules reabsorb some materials in the urine which the body wants to save such as glucose, albumin, etc. and also adjust the electrolyte levels of sodium, potassium and chloride. This process is reflected in the urine specific gravity. In the human 100 liters of water pass through the glomerulus in a day, but only 1 liter of water is eliminated in the urine. The kidny also helps in the control of blood pressure via ther regulation of sodium and water levels in the body. Lastly, the kidney stimulates the production of red blood cells through a hormone called erythropoietin. By evaluating the levels of BUN, creatinine, sodium, potassium, chloride and red blood cell percentage along with an overnight water deprivation urine sample we can get a pretty good idea of how the kidneys are functioning. Actually, the blood changes in kidney disease represent a later stage or kidney failure than can be dtected in the urine. When approximately 75% of the kidney is not functioning we see loss of the concentrating ability of the kidney which is reflected in a dilute urine. This may be noticed clinically as increased water consumption and increased urination (both amount and frequency). Blood changes don’t occur until about 80-85% of the kidney is non-fuctional. By evaluating urine samples after restricting water overnight we can monitor Shar-Pei for the development and progression of kidney failure. This is the basis of my recommendation to check urine samples every three months in this breed.